Brigitte Fassbaender (German pronunciation: [bʁiˈɡɪtə ˈfasbɛndɐ]; born 3 July 1939), is a German mezzo-soprano opera singer and a stage director. From 1999 to 2012 she was intendant (managing director) of the Tyrolean State Theatre in Innsbruck, Austria. She holds the title Kammersängerin from the Bavarian State Opera in Munich and the Vienna Staatsoper. Fassbaender was born in Berlin, the daughter of screen actress Sabine Peters and the baritone, Willi Domgraf-Fassbaender. The family settled in Nuremberg after World War II. She spent her early career in Munich. 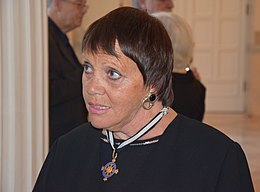 In addition to her operatic work, Fassbaender has performed in the concert hall as a Lieder singer and in movies, singing the role of Prince Orlofsky in the 1984 film production of Johann Strauss's Die Fledermaus. Her recordings range from operas, vocal works with orchestra, to Lieder, including Schubert's 'Winterreise' and 'Schwanengesang', oratorios such as Bach's Christmas Oratorio and Handel's Messiah, and also speaking roles after her retirement from singing. She has appeared in numerous televised opera productions now available on DVD, such as her signature roles Octavian and Orlofsky, both conducted by her frequent collaborator Carlos Kleiber. Fassbaender has also taught masterclasses. In 2010, she wrote the book and texts for two successful musicals - Lulu - das Musical and Shylock!, based on Shakespeare's Merchant of Venice. Both were a collaboration with the composer Stephan Kanyar and written for the Tiroler Landestheater in Innsbruck. In recent years, Fassbaender has worked in arts administration. She was the Opera director at the Staatstheater Braunschweig for two years from 1995 to 1997. In 1999, she became intendant (managing director) of the Tiroler Landestheater (Tyrolean State Theatre) in Innsbruck, a position she held until 2012. In 2006, she was awarded the Musikpreis der Landeshauptstadt München. In January 2011, the French Government appointed her an honorary Chevalier of the Légion d'honneur. More recently, she has been director of the annual Richard Strauss Festival in Garmisch-Partenkirchen. ^ "Fassbaender, Brigitte." Current Biography Yearbook. The H. W. Wilson Company. 1994 .p. 1973. ^ Andrew Clements (16 January 2009). "Strauss: Der Rosenkavalier; Watson/Fassbaender/Popp/Ridderbusch/Kusche/Bavarian State Opera/Kleiber". The Guardian. Retrieved 23 February 2015. ^ Andrew Clements (21 July 2011). "Mahler: Das Lied von der Erde – review". The Guardian. Retrieved 23 February 2015. ^ Tim Ashley (9 October 2014). "Strauss: Intermezzo CD review – darker than ever before". The Guardian. Retrieved 23 February 2015. ^ Daniel Ender (11 February 2014). "Junge Sänger kommen mit den Noten auf dem iPad". Der Standard. Retrieved 23 February 2015. ^ "Fassbaender wurde "Ritter der Ehrenlegion"". ORF (Tirol). 24 January 2011. Retrieved 23 February 2015. This page was last edited on 19 January 2019, at 20:21 (UTC).